Without constant awareness of automatic enrolment, a small oversight can easily result in an expensive yet avoidable mistake. 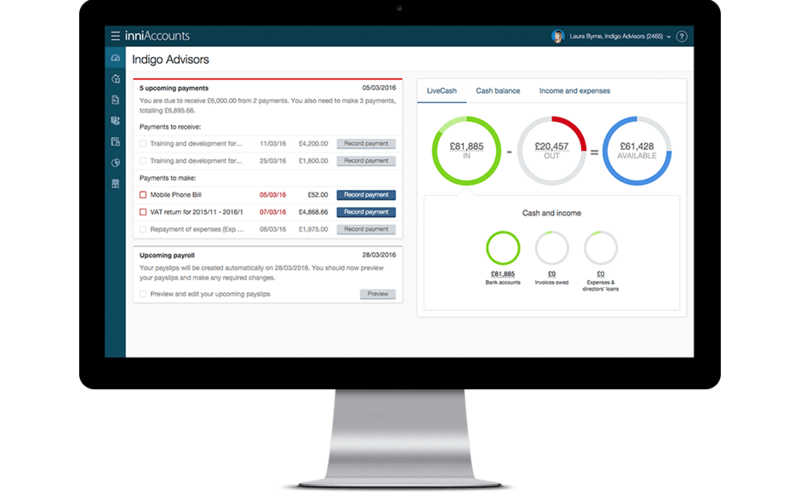 inniAccounts payroll has been updated with a number of innovative features to protect you. The rules for automatic enrolment aren’t overly complicated for most contractors. However, after your staging date it’s key to be aware that: should an eligible employee’s salary exceed the threshold for automatic enrolment, a workplace pension scheme must be set-up and your employee enrolled. If a salary exceeds the threshold, even if your employee has told you in advance they’ll opt out, you must still open a scheme and enroll them. Only then can they request to opt out. Inevitably if a workplace pension scheme is needed, there are associated costs and time required to set it up and support it. When a staging date has passed, there is a real risk automatic enrolment could accidentally be triggered. All it takes is for a salary to be a penny over the threshold for an employer to be faced with opening a scheme and enrolling the employee. This is probably time and money you’d prefer not to lose. For peace of mind and to reduce the chances of you making an expensive mistake, we’ve added a number of unique features to our payroll to alert and protect you. Payroll alerts and protection will be enabled automatically on your staging date. The risk of accidentally triggering the need to open a scheme will reduce significantly. When editing employees payslips, you will be alerted if any changes to salaries would exceed the thresholds for automatic enrolment. When an alert is triggered, you won’t be able to save your payslip until the salaries are reduced to below the threshold. Once your staging date has passed, if an employee needs to be paid a salary over the threshold, you’ll need to set-up a workplace pension first. To safeguard from unexpectedly having to automatically enrol an employee into a workplace pension, employees (non directors) salaries, overtime and bonus payments will be limited. If an employees income (excluding expenses) exceeds the thresholds on your payroll date, before their payslips are sent to HMRC via RTI they will automatically be reduced to the threshold. To alert you of the limiter being activated, a dashboard message will prompt you to take urgent action. Altering the employees salary or opening a workplace pension will stop the salary limiter being applied. There are situations where automatic enrolment applies that our payroll cannot monitor. For example, workers not on payroll such as self-employed contractors may need to be enrolled. As an employer it’s important you are aware of the legislation and how it affects you. The Pensions Regulator website has further information for employers. If an employee’s salary means they need to be automatically enrolled, you’ll need a workplace pension scheme. Once a scheme has been opened and configured in inniAccounts, the payroll protection is automatically removed as it is no longer required. With a scheme in place, your payroll will calculate employee and employer contributions and we’ll take care of submissions to your pension company. Please note additional fees apply for support with running a workplace pension – please contact your Account Manager for details. For more information on workplace pensions and automatic enrolment, take a look at our guides.